I’ve said the above a few times out of frustration during my plays of Bloodborne, but each time, in the end, I know exactly why I did: I got reckless or bloodthirsty. If anything, Bloodborne has taught me that I am, in fact, not as plotting and calculating as I’d like to think… At least not when it comes to killing monsters in the streets of Yharnam. I know full well that I died this time because I went in and just started hacking and slashing away in a closed space filled with five enemies. Naturally, they had stun-locked me in a corner and made me all kinds of dead. The choice to recklessly run in and try to kill them before they reacted was a choice I had made. In subsequent runs, I had lured them outside the room until the odds were a much better “only two against one”, which had led to my eventual success. The point was, I had initially chosen a tactic, which was clearly the wrong tactic for this scenario, and it failed me. Instead of adapting and changing, I had repeated the same exercise two more times, inexplicably thinking “yeah, it’ll work this time”. It had led to failure, and that failure was entirely on me. The game did exactly what it was meant to do and what it was programmed. Myself, the logical, can-change-plans-if-needed being that I am, had not utilized what was available to me, so I only had myself to blame. This mindset was an important one to transfer from the video game to the board. You want the result of your encounters to be driven by the choices that you, as a player, make. With this being one of the single most important facts about the game’s design, it also made one thing starkly clear from the beginning: dice had to go. I had actually been toying with the idea of a dice-less dungeon crawler for a long time now, years in fact. Just one of those little ideas for a project you pack away and think “someday” (a day which may never actually come). When the topic of Bloodborne’s design came up, this idea immediately came to the forefront. Of course, having an idea and making that idea into something tangible is where the work happens… Well, the start of the work, anyway. Looking back, there was actually a number of systems we tried out, but it was always card-driven since the beginning. There were early versions that had a set hand of action cards, a sort of “action board” you laid cards on, and numerous other semi-systems that came and went before we eventually decided on the deckbuilding theme, and even that ended up incorporating elements of previous versions and systems (but more on that another time). The end goal was, of course, to mitigate luck as much as was healthy- you do always need a small amount of surprise element, least the game just become a big math exercise, but, especially given the nature of the video game, luck had to be minimal, and the decisions of the player had to be the main deciding factor in success and failure. 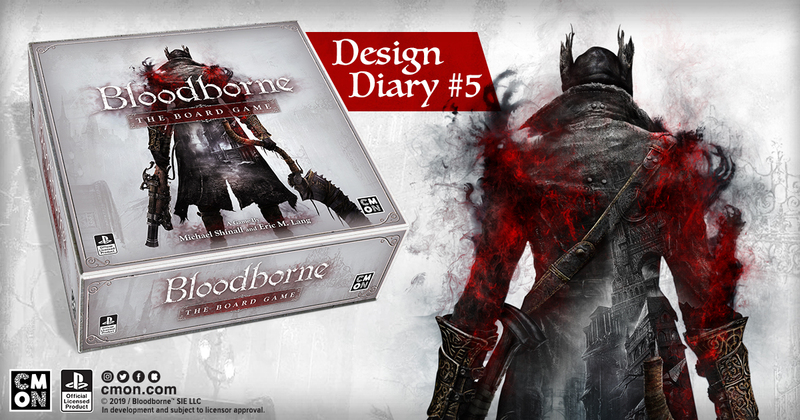 With the Bloodborne Boardgame, the things that determine success or failure are divvied up between a number of factors, all of which a player has to consider: Your Trick Weapon, with its two different forms, and thus two different styles, is the main or “primary” choice a player will make: It determines how you approach each encounter. Each side is composed of a number of Attacks, each with various Speed, Damage, and an Ability unique to that form. Is your weapon a big, slow, damage dealer? Or is it quick and fast? That’s going to change how you approach things. How does that interact with the enemy? Will they punish you for attacking slow? Finally, you have your Stat Cards, taken from your hand/deck, that will augment your attack in some fashion, all with drastically different uses. Do you need more Damage? Strength. Is raw speed the answer? Skill. Mitigate some of that incoming damage? Vitality. Lots of little decisions and choices, none of which a player might even be consciously aware they’re making each time (unless they devote time to reflect and think about it). All of which contribute to the end result: Will you succeed, or will you fail? Most importantly, however, was at no point in any of that “I hope I roll enough 6’s” or “I need to roll a 9+”. It was a serious of calculated decisions and risks that the player chose. And that, to me, is one of the key elements of the Bloodborne experience, both in the video game and in the board game. Don't miss the launch! Follow us on Facebook and Twitter.